A fall flight over the Mexican coast where the Colorado River meets the Sea of Cortez offered me a gut-punching, eye-screwing, visual on the results of impaired flow. The semantics of ‘unimpaired’ and ‘impaired’ flow have laced the language of California water management debates since some engineer invented these politically ‘neutral’ terms long ago. The terms refer to our alteration of freshwater flows from snowmelt and runoff by dams and diversions. But whatever the labels, or whichever estuary you’re referring to, keeping these flows from reaching the sea via rivers can starve these aquatic ecosystems of their liquid life force. Whether it’s the vast yellowing salt flats that are all that remain of the mighty marshes of the pre-dam Colorado River delta, or our own estuary at the mouth of the Sacramento and San Joaquin Rivers, when we “impair” the flow from the mountains to sea, the result is ecological trauma. 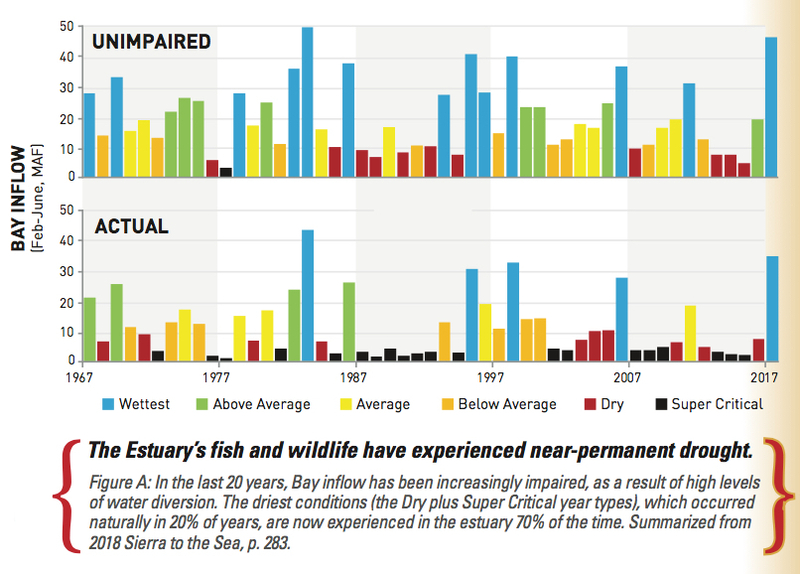 Twenty years ago, the Bay Institute released its own drill-down into this impairment, writing the first ecological history of the vast Central Valley and San Francisco Bay watershed stretching “From the Sierra to the Sea,” as the report is called. A variety of water users, stakeholders, and well-known engineers weighed in on the conclusions, making it more like an early attempt at water community consensus on baseline conditions than an environmental manifesto. In December 2018, the Institute released a 20th anniversary edition –hardbound, and glossy – that includes both a faithful reproduction of the original maps and history, as well as a data-packed, 18-page Afterword summarizing more recent trends. The evidence presented in the new edition’s Afterword is a record of continuing collapse. 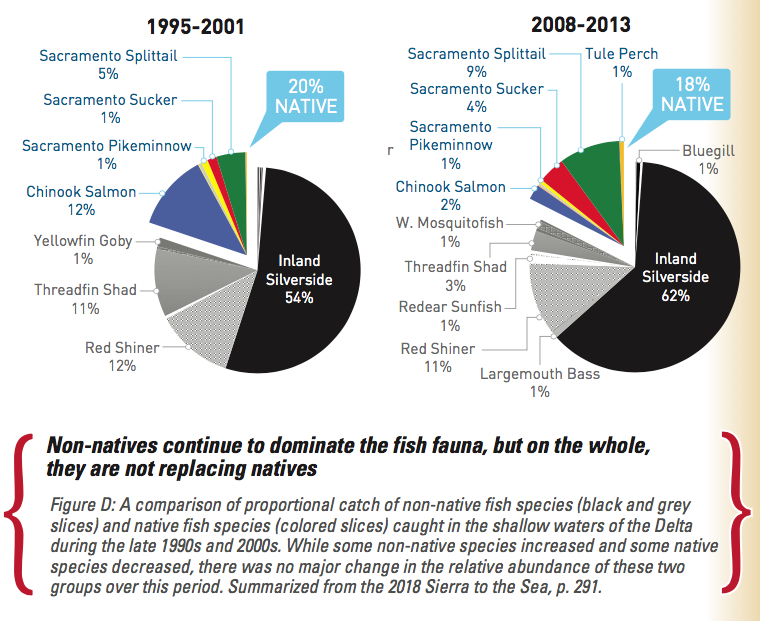 Four more native fish populations (and orcas that feed on Central Valley salmon) have been added to the list of endangered species. Three listed species – winter run Chinook salmon, and longfin and delta smelt – declined by more than 97 percent between the environmentally-proactive late 1990s and 2017. Salinity from ocean tides continues to creep up estuary. Exotic fish are happily ensconced in an altered food web. Extremely high levels of water diversion combined with reduced snowpack, low inputs of sediment from upstream, pollution, and rising sea levels are all exacerbating ecological effects. The 18-pages and twenty years (1998-2017) spanned by the Afterword cover changes in inflows, outflows and reverse flows; Central Valley water use; tree crop acreage; native and non-native fish abundance; as well as rising temperatures and water levels due to global warming. More charts and maps fill the pages than words, a mere sampling of which is presented in this article. In some cases, the authors pulled together data from multiple sources to show the interactions between different parts of the estuary and its watershed; in other cases they built on analyses from other well-respected sources and worked to place them in context or extend their scope. Pulling it all together, the authors come to a variety of conclusions. For one, they counter the argument that major improvements in flow have resulted from the last three decades of policy change. 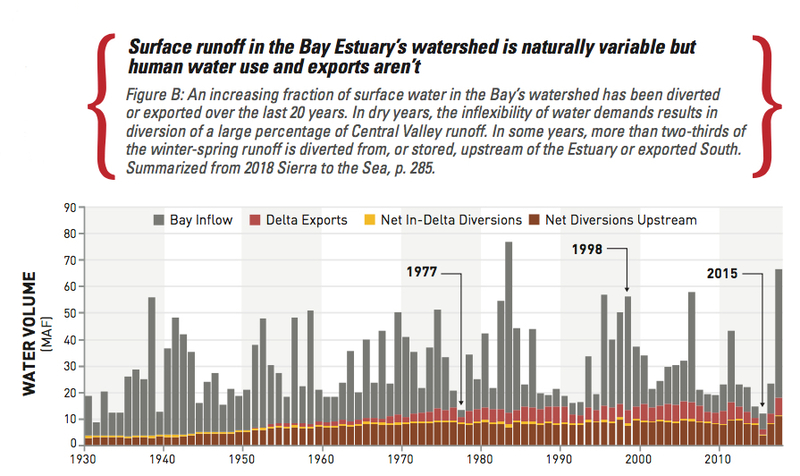 Actual fresh water flowing from the Sierra and Central Valley rivers to the Bay and ocean is now so diminished that the driest Bay inflow conditions, those that would naturally occur 20 percent of the time, now occur 70 percent of the time (see Figures A and B). Without significant flow reinstated to buoy ecosystem processes and habitats, native fish are sure to collapse. 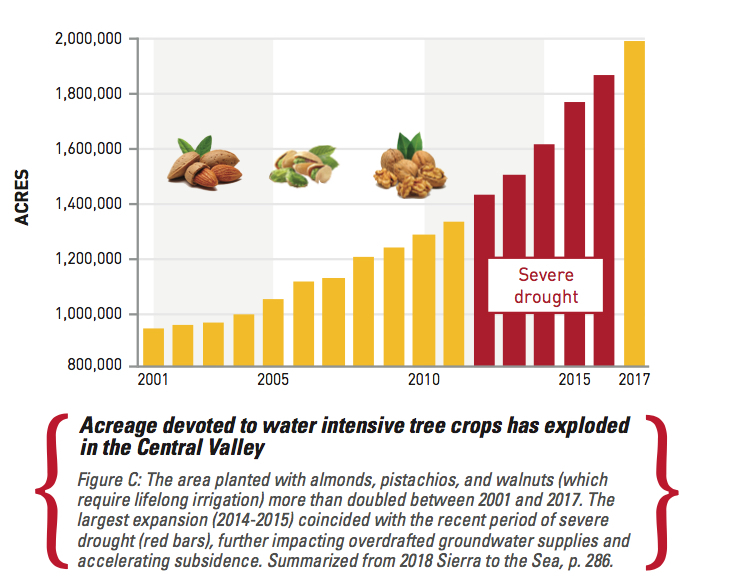 Another conclusion is that despite severe drought and depleted aquifers, the acreage of water intensive tree crops in the Central Valley has exploded (see Fig C). “It makes us realize we should be careful what we wish for,” says Bay Institute report co-author Peter Vorster. Vorster admits that environmentalists have long argued that scarce snowmelt shouldn’t be used on low value crops like alfalfa. According to the Afterword, acreage devoted to high value walnuts, almonds, pistachios doubled between 2001-2017 – increasing by more than million acres – mostly in the groundwater-overdrafted San Joaquin Valley. Other conclusions relate to the changes ahead not behind us – as global warming produces hotter temperatures, more extreme weather including flood events like Oroville, and rising sea levels that will inundate low-lying habitats. As the Afterword notes, at the time of From the Sierra to the Sea’s publication in 1998, estuary managers recognized global warming as an emerging environmental threat but little imagined its pace and magnitude. 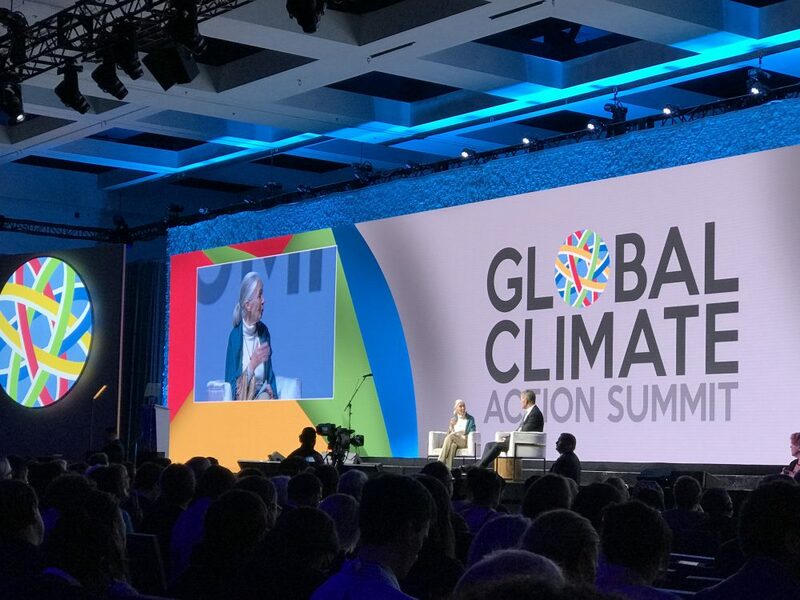 What’s clear now, however, is that change will occur more rapidly than previously thought, with serious implications for ecosystems. 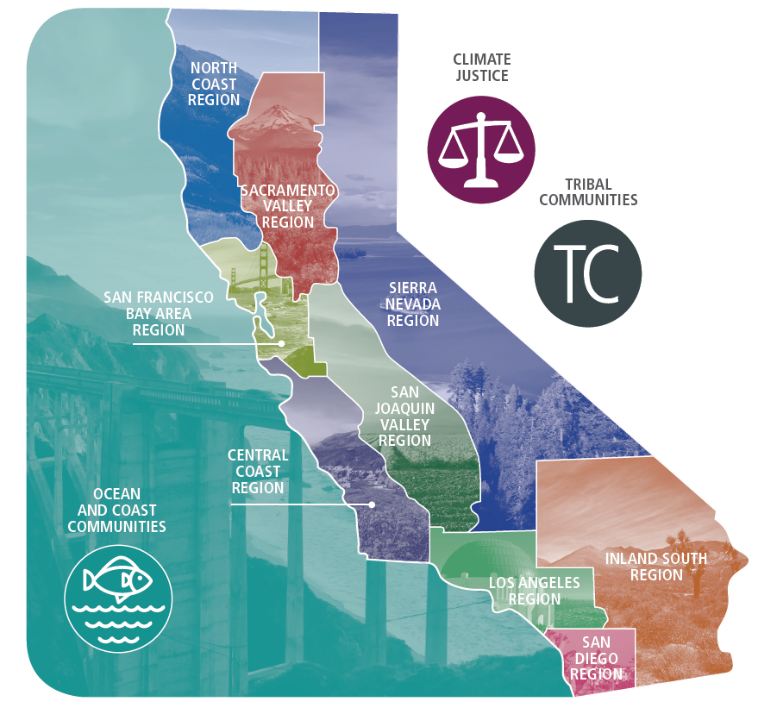 Even as early as the 1998 edition, the Bay Institute and all those who contributed to the first From the Sierra to the Sea report were recommending landscape scale restoration efforts including support for ecosystem processes such as sediment movement. This early work stimulated a number of further, more detailed, ecological histories and recommendations. The San Francisco Estuary Institute, for example, went on to produce a triumvirate of detailed studies that are now the foundation of Delta conservation management recommendations (Delta Historical Ecology, Delta Transformed, Delta Renewed). “From the Sierra to the Sea really helped validate the importance of big-picture studies of landscape change, opening the door for more granular analyses like our Delta work,” says the organization’s senior scientist Robin Grossinger. The new edition’s Afterword restates an obvious conclusion that can now be found in a plethora of scientific and technical documents and management plans, if not political platforms, namely the need to recognize and support processes not just places. And that’s where water comes in again: “What binds together any network of pre-existing or restored habitat reserves in this system is fresh water,” says the Afterword, which mobilizes sediments to create and maintain physical habitats like marshes and beaches; creates low salinity habitat when it mixes with salt water from ocean; transports organisms, nutrients and prey between habitats; cues migratory behavior in salmon and other species; and limits contaminant effects on the ecosystem. 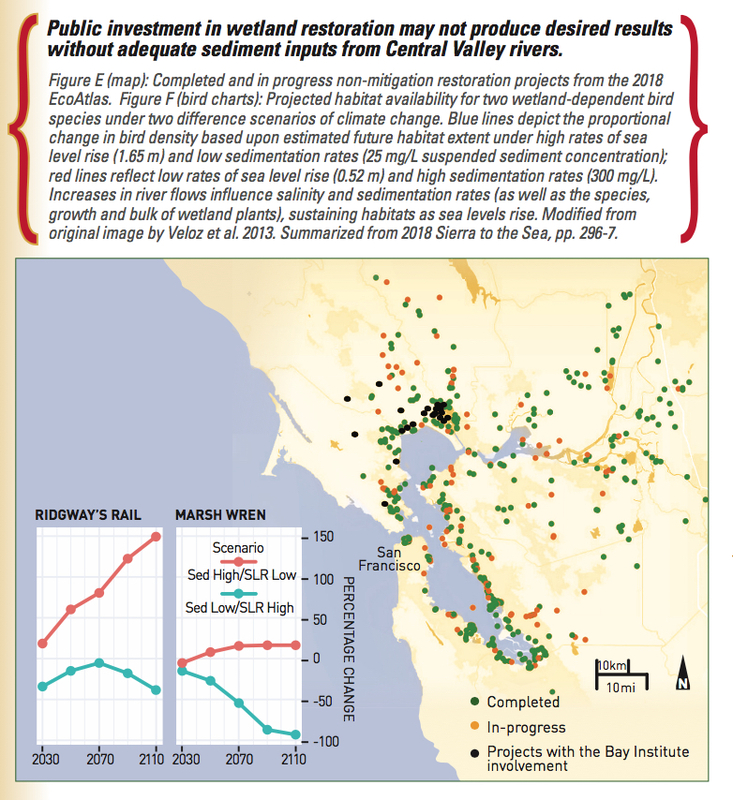 More attention needs to be paid to these ecosystem processes, the Afterword finds, despite the gains made with the addition of hundreds of acres and miles of restoration projects up and downstream in the last 20 years – from gravel augmentation in tributaries to levee setbacks and floodplain expansion in Central Valley rivers to wetland and creek restoration around the Bay. These include one of the largest and most ambitious projects championed by the Bay Institute – restoring fresh water and salmon to 150 miles of the San Joaquin River, once dry down to the sandy river bottom due to “impaired” flows. Landscape managers are now concerned that all this work to grow species and habitats will be undone, or produce different outcomes, as air and water temperatures rise and the ocean advances upstream. Recent fires, floods and drought have already galvanized the public to consider more ways to support natural resilience. The political will to really reshape land use practices, however, remains weak, as have commitments of more flows to fish. “Governor Schwarzenegger’s Delta Vision task force did a great job of highlighting all these emerging threats and how we needed to reconnect and rehabilitate parts of the estuary. Then we got sidetracked. Governor Brown then got fixated on delta conveyance rather than larger water management changes and California lost a precious decade when we could have been addressing the root causes of the Estuary’s decline,” says Bobker. “Now is the time to do the rest of the restoration, to add the critical element of water, if we want our investments to pay off,” says Rosenfield. “Building resilience doesn’t require us to stop all human use of California’s water, just to do a better job of sharing it,” says Bobker.